Child Care Aware® of America has conducted several national polls and focus groups throughout the country to better understand parent preferences when selecting child care, what they look for, the assumptions they make about licensed care, the choices they have in their community, and policies or programs they believe would strengthen the quality of child care. During child care searches, transitions, and beyond, families want consumer information to be easily accessible, relevant to their experiences, understandable and trustworthy. More than any other aspect of child care, parents are concerned about quality. They want their children to be safe. Families want their children to be learning. 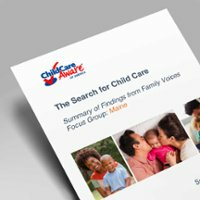 They desire these qualities to be present in child care settings that they can afford and be located in their communities. 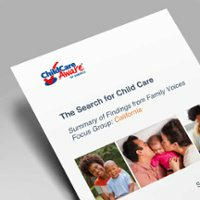 This section includes insights about child care and early learning gleaned from experiences shared by families and community members. 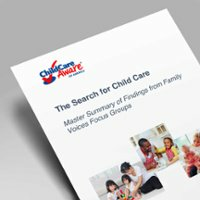 Looking for one of our many earlier Parent Perspectives focus group or poll summaries? Check out our Archives Page.